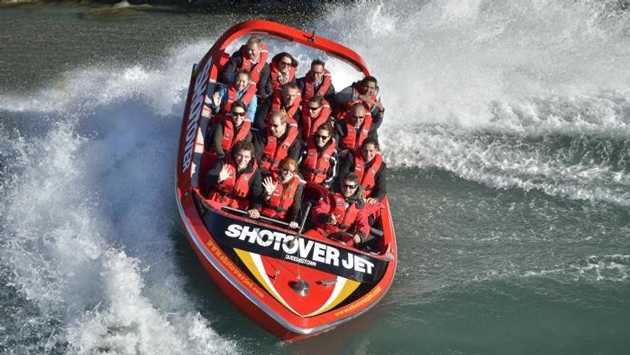 Kate Middleton and Prince William continued their tour in New Zealand on Sunday, April 13, with a ride on a Shotover Jet, which dubs itself as the "world's most exciting jet boat ride." And judging by the photos, the Duke and Duchess of Cambridge appeared to enjoy the action-packed, adventurous water excursion. After arriving, William and Kate changed into waterproof coats and life jackets and then made their way down a ramp into one of the 15-seater boats. The duo waved for souvenir pics and greeted hundreds of tourists who had gathered downstream after their water ride. 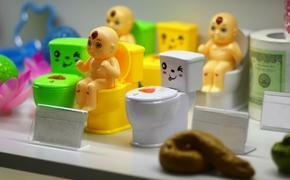 The royal couple returned 20 minutes later, exhilirated and damp. "They were both grinning," one observer told Us Weekly. "William said to Kate ‘that was so much fun!’ and they were giggling as they came back to shore. Both a bit wobbly legged I think." Wayne Paton, the operations manager for Shotover Jet, took the royals out on the river. Wayne, 43, told reporters, "They loved it, the Prince wanted me to go closer to the canyon walls. He said, 'You can go closer than that.'" "There were some screams, but not from them. It didn't seem to phase him at all he was right into it and so was the Duchess," he added. It certainly sounds like they had a good time! We may have to book a trip to New Zealand soon so we can ride the Shotover Jet.